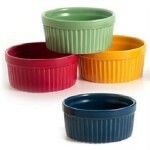 Festive Colored Porcelain Ramekins – A Perfect Gift For The Holidays! Perfect Gift For That Special Grandma On Your List This Year! 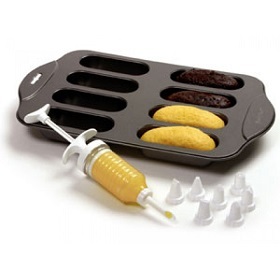 They’re handy baking cups. Traditionally, they’re used for custards, crème brulee, and desserts. They’re great for fancy little cakes and cobblers. We have a recipe for a blueberry lemon crisp we were going to bake in these cups and just haven’t gotten that far. 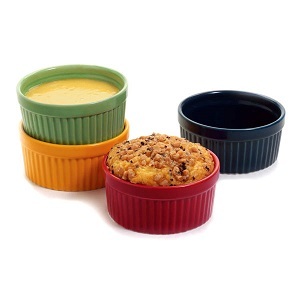 You can convert many desserts—like cobblers and crisps—into individual desserts baked in ramekins. Little chicken pot pies work in ramekins. There are hundreds of things you can bake with them. Use these classy porcelain ramekins in the oven for crème brulee, molten lava cakes, custards, soufflés, muffins, and desserts. You’ll find lots of uses for these pretty little porcelain dishes. 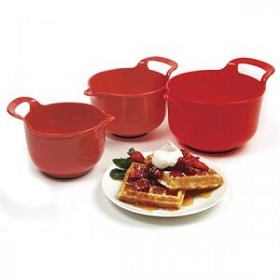 Give these as a gift or get them for yourself and add a splash of color to your kitchen. ~*~*~*~*~*~*~*~*~*~*~*~*~*~*~Learn The Art Of Baking!We’ll teach you everything you need to know to become an expert in the kitchen. Great For Outdoor BBQ’s This Summer!! * You can put a layer or meat, then a layer of cheese or other filling, then a layer of meat. For the first method, add grated cheese, peppers, onions—whatever—right into the burger meat before forming the patties. For the latter method, we used to tinker around with a burger press making two thin patties and then squeezing a layer of cheese between the two and pressing the edges tighter to seal in the stuffing. That works. Now there is an easier way—a stuffed burger press. With a stuffed burger press, you can make conventional burgers or stuffed burgers. 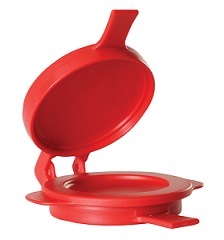 The stuffed burger press creates a well, and indention in the burger patty that you fill with cheese or other goodies. Then you add more burger and the press forms the patty with the filling inside. For us, one of the real advantages of stuffed burgers is that we can use lean meat. 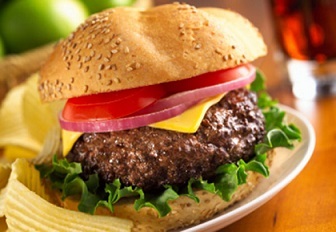 For most burgers, you need a relatively high fat content; use 80% or 85% lean burger. It’s the fat that makes the burger juicy and satisfying. But with these burgers, you can use leaner meat because there is cheese, butter, or bacon interspersed in the meat. And it takes less cheese to make a cheeseburger this way. It’s fun to be creative with burgers. Surprise your guests and make Cheese-Stuffed Burgers, Buttery Onion Burgers, or Tex-Mex Burgers. Here are eight great burger ideas to get you started. 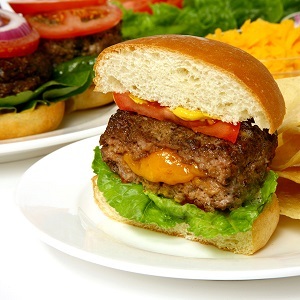 Make Cheese-Stuffed Burgers. Instead of placing the cheese on top of the burger, use a stuffed burger press to make stuffed patties. Or toss grated cheese with your meat before forming conventional patties. Make Swiss and Mushroom Burgers. Make a cheese-stuffed burger as above but with Swiss cheese. Top the burger with sautéed mushrooms. Make Tex-Mex Burgers. Toss your ground beef with diced green chilies, chopped cilantro, and shredded Monterey jack cheese before forming the patties. Mix in some taco or other southwest seasoning. Make Cheese and Herb Burgers. Make burgers as for Tex-Mex burgers but instead of chilies, use your favorite herbs. Make Blue Cheese and Bacon Burgers. Mix crumbled blue cheese into the ground beef. Cook and top with crisply fried bacon. If you are cooking on the grill, try wrapping the bacon strips around the burger patties before cooking. Secure the strips with toothpicks. Make Italian Burgers. Mix one part ground beef with one part ground Italian sausage. Form patties. Season with additional oregano and basil or mix some in a little Italian dressing. Use a stuffed burger press if you would like to put cheese in the center. Make Chuck Wagon Bacon Burgers. Microwave bacon until it is partly done. With kitchen shears, snip the bacon into bits. Mix the bacon bits into your ground beef along with your favorite seasoning. If you would like a little more flavor, open a can of mild diced chilies and mix that into the burger. Do not over mix the meat. Form the burgers with a burger press. Make Asian Burgers. Pick your favorite Asian sauce — Thai Sweet Chili Sauce is one of our favorites—and mix it into your burger. Because it’s interspersed through the meat flavoring every bite, it won’t take a lot. Seasonings for Your Burgers. * The Prepared Pantry spice line includes a broad range of spices and some blends. * The Colorado Cattle Company is a line of barbeque and grilling spices. The original burger and steak seasoning is one of my favorites for burgers. * Yellowstone Seasonings has several very good regional blends. * Teeny Tiny Spice Company of Vermont has a wonderful in of International and North American spices. * Gresham and Myers is a line of rubs that work very well for standard seasonings. Dennis Weaver and his wife, Merri Ann, are the founders of The Prepared Pantry Dennis is a baker and a writer. 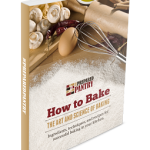 Dennis is the author of How to Bake: The Art and Science of Baking. He is a food columnist and has written articles for websites, newspapers, and magazines. You can follow Dennis and get his articles and recipes by subscribing to the newsletter at The Prepared Pantry. I’ve been married for 33 years to Merri Ann. She’s the light of my life. My joy is to please her. 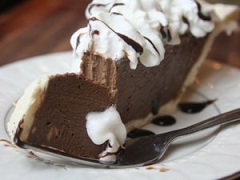 She can’t eat wheat but I can make her a Legendary Flourless Chocolate Cake. 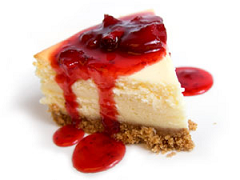 I’ll drizzle it with raspberry sauce and top it with raspberry whipped cream with a touch of cream cheese added. Make Cupcakes. Yesterday we made raspberry chocolate cupcakes with raspberry filling and raspberry cream cheese frosting. The day before, we made the cherry version. 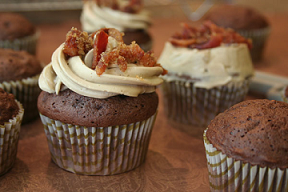 If you want to go really special, make Maple Bacon Cupcakes. See how to make these cupcake recipes. Make Chocolate Lover’s Muffins. These are a breeze—just add water. They’re made with famous Ramstadt Breda cocoa and mini chocolate chips. 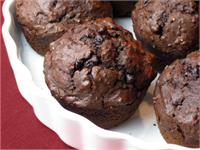 Make Chocolate Lover’s Muffins for only $4.99, Regular $6.99. 1. Peel the meat from the carcass. Divide it into portions, a pound or so in each depending on the size of your family, place it in zipper-type bags. 2. Set aside enough meat for a few turkey sandwiches. Of the remainder, freeze all but what you’ll use in the first three days. 3.Save the gravy and the bones with meat attached for soup. If I’m going to make soup right away, refrigerate it or else freeze it for later use. 4.Find a half dozen turkey recipes you would like to try. You won’t use all of them, but having them available will give you options and something to look forward to for diner over the next several weeks. Turkey salad. I love club sandwiches and I want something very simple. This turkey club salad is made with club sandwich components. The bacon is cooked in the microwave. Turkey soup. We don’t have snow yet but there’s a chill in the air. I want a hearty soup. This turkey white bean chili is very quick and simple to make . . . and good. Turkey pot pies. This is easy comfort food. You can make them in the ovenproof bowls you have in your kitchen. If you use our just-add-water pie crust mix, you’ll have the crust made in a minute and the pies in the oven in less than fifteen. See how to make quick turkey pot pies. Turkey enchiladas. My mother made chicken enchiladas; we loved them. We morphed her recipe to use leftover turkey and gravy. In fifteen minutes and with the microwave, you can have these turkey enchiladas ready for the oven. Add a tossed salad and open a can of beans or refried beams and you’re ready for dinner. Turkey wraps. 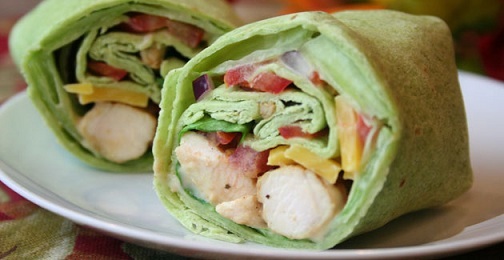 Wraps make quick, easy, fun meals and you can be as creative as you want to be. Grab some tortillas from the store or make your own tortillas. 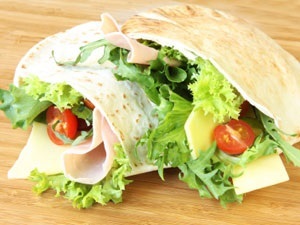 Spread them with mayonnaise, a sandwich spread, or salad dressing and load See how to make a wrap with wrap ideas. Years ago, probably when we still lived in Alaska, I bought this little cookbook called, The Weekend Chef. In it was a recipe for an everything-on-it pizza. It turned out to have a big thick crust and a boatload of toppings. The crust was partially baked and the meats precooked and the toppings loaded on and the pizza pushed back into the oven. It really good but with all that prep and rising twice, it seemed like an all-afternoon project. It was too big and too rich and I still remember the heavy feeling after dinner. I don’t eat pizzas like that anymore. 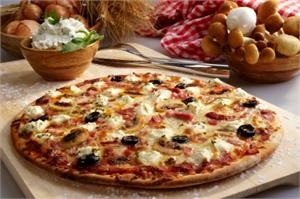 Over the years, our pizzas have become lighter and thinner, certainly healthier. The crusts are thin and crisp. 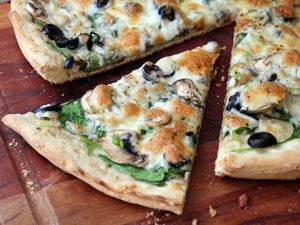 The toppings are much fewer, often with fresh veggies, and with a light layer of cheeses. I’m enjoying these pizzas and I don’t have to look away if I see my doctor in town. Debbie Frantzen, our daughter and operations manager, is the queen of thin crust pizzas. She takes our pizza dough mixes, adds the water, mixes them, and then divides them in half. She uses a pizza stone and a pizza peel and makes two 14-inch pizzas out of one mix. She rolls them very thin and bakes them crispy on a preheated pizza stone. I’m lazy. I just roll about two-thirds the dough out in a dark colored pizza pan. I have enough dough left for a couple calzones. I have two pizza pans, an old battered relic that’s nearly black from use and a newer perforated pizza pan that is perfect. I sprinkle a little cornmeal on the greased pan and roll the dough in pan using a pizza roller. The dark pans absorb heat and the thin crusts bake quickly and crisply. Debbie taught me that you don’t have to stop and let the crusts rise. If you make and roll the crusts first, they’ll rise enough while you’re prepping and loading the toppings. 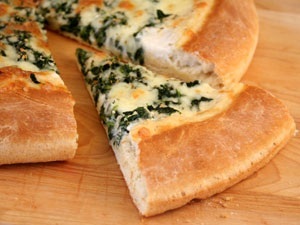 Plus you’ll get oven spring, a rise in the oven, and the crusts will be crispy by the time the toppings are done. It makes for a very quick and simple pizza. If you grease the pans well and sprinkle them with cornmeal, the pizzas will slip right off the pan. Slip a spatula under the pizzas and twist it around the pizza to make sure that it is not sticking anywhere, clasp the pizza with the spatula underneath and your thumb on top of the edge of the crust, and quickly slip it off the pan onto a cooling rack. You need to remove the pizza from the pan immediately so that it doesn’t sweat. The enemy of thin crusts is “springback.” The gluten in the dough makes the dough elastic. As you try rolling it thinly, it springs back. It has a memory and doesn’t want to roll out thinly and smoothly. It’s almost impossible. When we first started developing our pizza dough mixes, we added rye flour to dilute the wheat gluten. We still couldn’t get the dough soft enough. So we started experimenting with commercial dough relaxers. We found one that was like magic. We could make the dough just s soft and pliable as we wanted and absolutely eliminate springback. 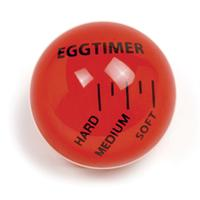 We now use this in all our pizza dough mixes and tortilla mixes. Since we absolutely love this relaxer, we now package and sell it. If you are going to make pizza dough from scratch, buy this dough relaxer. 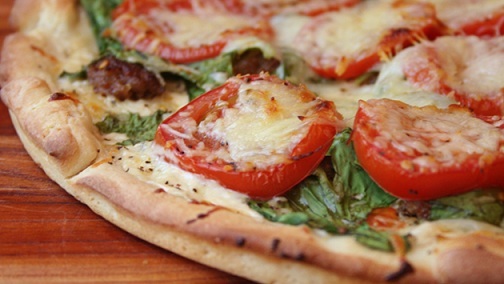 It’s essential to your thin crust pizzas. We also sell a pizza flour blend with the dough relaxer already added. The amount of relaxer in this blend is just right. Debbie discovered a white sauce pizza in the little one-service-station town where she lives, Ririe, Idaho. It had a white sauce made with minced onions and topped with new red potatoes sliced thinly. She brought some to work; it was very good. but we’ve made pizzas with green beans, with zucchini, and broccoli—often with no meat. Top the veggies with a thin layer of cheeses. Dennis Weaver is the founder of The Prepared Pantry. He is the author of How to Bake, a 318 page book about the art and science of baking. 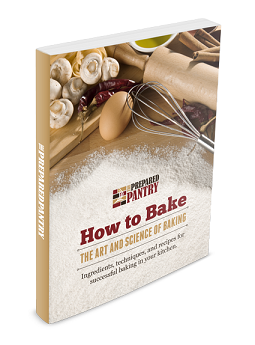 You can download a free copy of How to Bake Here! By Dennis Weaver at The Prepared Pantry. We set off to make the best and easiest omelet. We bought ten dozen eggs, scoured the text books for methods. At the end, we were making five minute omelets a little unorthodox but very good and nearly foolproof. That was three years ago. Since then, we’ve made hundreds of omelets. The method hasn’t changed—with one minor exception. When it’s time to let the eggs set and cook through, I place the plate over the top of the pan to capture the heat. 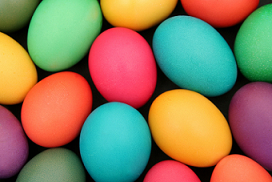 The eggs cook more quickly with less of a crusty bottom. As a bonus, I have a hot plate on which to serve the omelet. I only leave the plate on for a couple minutes, until it’s time to stack on the filling. Watch the imbedded video and study the easy steps. The video doesn’t show putting the plate over the pan but it is an easy step to insert. Choose the right size of pan. A three-egg omelet requires an eight-inch pan. The pan should be nonstick. Put a pat of butter in your nonstick pan. Place it on medium-high heat. On our stovetop, a high BTU gas burner, that’s 6 out of ten. Heat the butter to just short of brown and swirl it around the pan. Scramble the eggs with a soft silicone spatula scraping the bottom and sides of the pan. The eggs will cook quickly and curds will form. When the eggs approach the consistency of cottage cheese with mostly solids but some liquid eggs, stop stirring. Use the spatula as a paddle to pat the eggs down into an even layer. 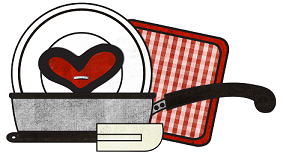 Place a plate on the pan, right side up, to capture the heat and cook the top of the eggs more quickly. Let the eggs continue cooking until the liquids are set and the top of the omelet is cooked. Remove the plate. Place the fillings across half of the omelet. If you are right-handed, put them on the left side of the omelet. For most fillings, you will want them pre-cooked. Let the heat from the pan heat the fillings for a minute. The omelet should slip around in the pan without a hint of sticking. Move the pan to a plate, tip the pan on an angle over the plate, and gently shake the omelet onto the plate filling side first. When the omelet is about half onto the plate, twist the pan with your wrist folding the remaining omelet over that on the plate. 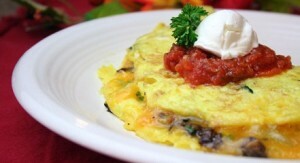 The omelet should be folded over with the bottom edge protruding about one-half inch. Your omelet should be golden brown and puffy with the interior set and any cheese melted. For larger omelets, use larger pans. Unless you’re going to make larger omelets, you’ll need an eight-inch skillet which is the perfect size for a three-egg omelet. It needs to have a good nonstick surface so that it will slide out of the pan easily. You’ll also need a good silicone spatula to stir the eggs as they begin to cook and to slide under the omelet and loosen it if it starts to stick. Zucchini squash grow to the size of boats. That’s not the real problem; there are so many of them. It seems that everyone in the valley is awash with them. And every year, we wish we had more zucchini recipes. My mother made an applesauce cookie that was cakey and moist. She loaded it with raisins and nuts sometimes and sometimes chocolate chips. I loved those cookies. I wanted to make a similar cookie, a zucchini cookie, like my mother’s applesauce cookie, one that could be loaded with different ingredients to create different cookies. Today, we have more ingredients to work with. I don’t ever recall my mother having white chocolate chips or dried cranberries. I figured that with a very good basic cookie, we could make hundreds of variations. It would be the last zucchini cookie recipe we would ever need. So I set off to the test kitchen to make a new cookie recipe. 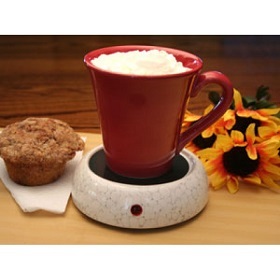 This would be a do-it-yourself cookie recipe, one that you could customize it any way you want. One day, it could be a chocolate chip cookie recipe and the next, you could make tropical fruit cookies—all with the moist, chewy goodness of zucchini. 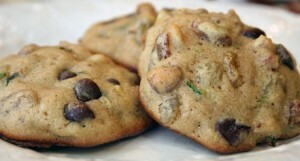 There would always be more zucchini cookies to make. And it’s just so darned good. No wonder it’s the last zucchini cookie recipe you’ll ever need. The recipe worked. The cookies were darned good—cakey and moist like my mother’s applesauce cookies. We made hundreds of them in a half dozen variations and served them to people in our store. People asked for the recipe. When you develop a recipe, you want the same results time after time. That wasn’t happening. Sometimes the cookies were perfect but others spread too much. I was using exactly the same ingredients and baking them exactly the same way. Why weren’t they turning out the same? Finally, I gave up and went home. That night it hit me: I wasn’t mixing the batter the same way each time. Zucchini is 95% water. With my cookies, I was mixing my batter for different lengths of time, sometimes at different speeds. With more mixing, I was wringing more water from the batter. That batter was wetter and the cookies spread more. As soon as I was consistent with my mixing, my results were consistent and I was able to complete my recipe. Always treat your shredded zucchini gently and if you have water standing in the bottom of the bowl of shredded zucchini, drain it out before adding it to the batter. Add the zucchini right at the end. Don’t pound the zucchini as you mix in the nuts or the spices. 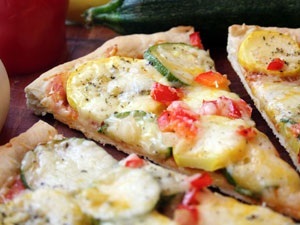 Treat your zucchini gently; don’t mix any longer than is necessary to disperse the zucchini through the batter. With these lessons learned, I always had consistent cookies. Cookies may be the most sensitive to hydration, the amount of water in the batter, but it makes a difference with other recipes to. Now, regardless of what the recipe says, I now always add the zucchini at the end and mix only until combined.